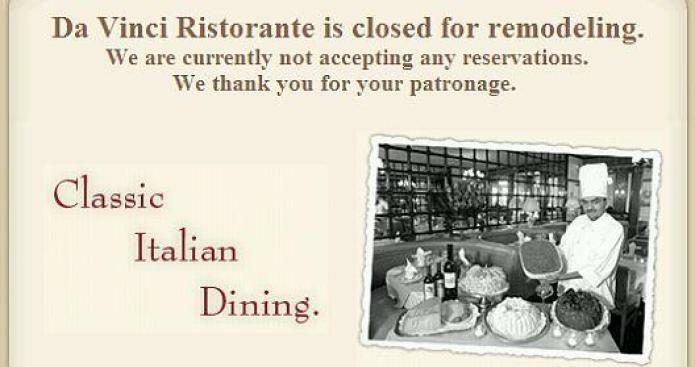 Mark this in a possible "temporary" shutter, but we were tipped off that Da Vinci Ristorante, a Bev Hills classic that opened in 1979, closed. Sure enough, according to the website and outgoing phone message, the restaurant is "remodeling," but the "we thank you for your patronage" feels more permanent than temporary. Rumor has it that there's been more owner and management changes, but we're yet to confirm. While it doesn't have the the red leather booths of yore (find those at La Dolce Vita next door), Da Vinci has a storied past that includes lots of celebs including Dino drinking Cutty on the rocks at his favorite table number nine.